The Mount Lawson State Park has long been a favourite place for my lady and I, as it’s close to home and has some great bush walks and 4WD trails to explore. 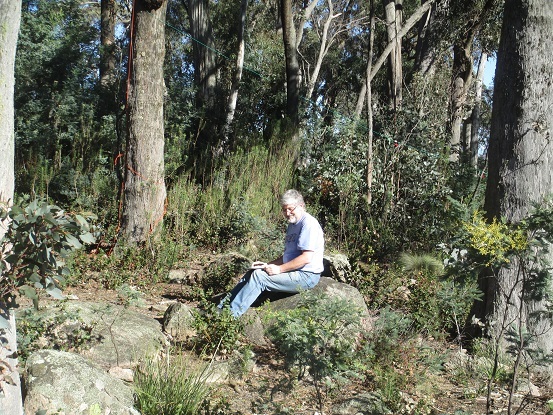 There are three SOTA Summits within the park including Mount Lawson itself, which we have activated twice before. We have for a long time intended to explore and activate the other two, so we decided to start with the unnamed Summit VK3/VE-154. 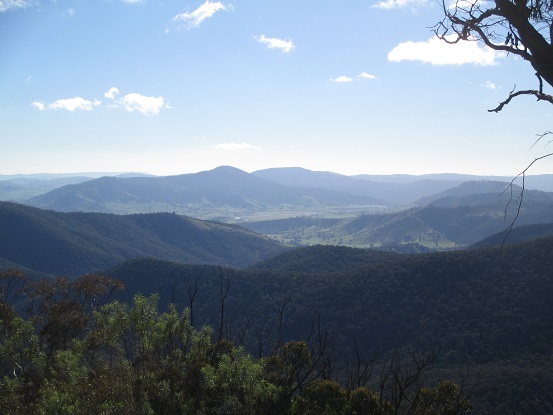 This is located in the southern part of the Park and is accessed via the Firebrace Track, a 4WD trail that wends its way across the Park from Mt Lawson Road to Granya Road. It is possible to access this trail from either end, but having traversed the whole thing once or twice before we knew that the Granya Road end crosses private land where there are several gates to open and close on the way through, so we decided to make it easy and we went in from the Mt Lawson Road end. 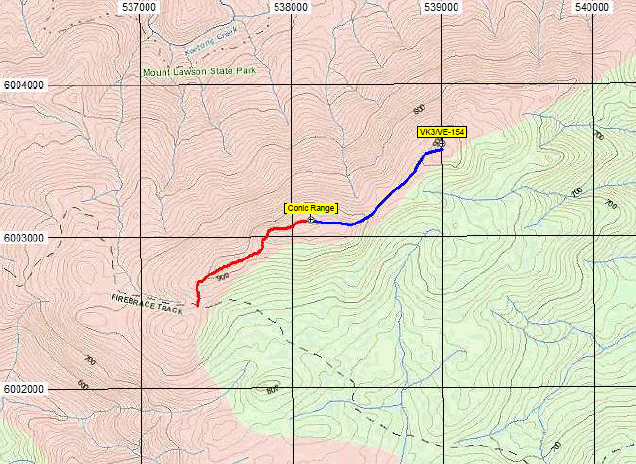 Both Mt Lawson Road and the Firebrace Track are accessible using a 2WD vehicle. The topographic map of the area suggests that the location given in the ARM for the Summit is incorrect, as there’s a higher point about 1km to the southeast. We decided that this expedition would be a good opportunity to check that out. I had a strong suspicion that the high point – the correct location for VK3/VE-154 – was actually the Conic Range, also known as Conic Rocks, which is shown on the Park map and is a well known local viewing point. We decided to approach the Summit using the Conic Rocks walking trail, which starts from a parking area on the Firebrace Track (36.121080S 147.415360E). There’s a fire pit there and there used to be a picnic table, which we were surprised to see has now been removed. The trail has been marked and is quite easy to follow, although it’s getting quite overgrown in some places. It goes very steeply uphill from the parking area for about 300 metres and then levels out into an easy uphill stroll through relatively open bush. On the way up, there are some great viewing places and some very impressive rock formations to check out. It’s about 1.5km from the parking area to the Conic Rocks viewing point, which is marked with a Parks Victoria sign so that you know you have arrived. The views down across Koetong Creek are breathtaking, so it’s worth taking the time to stop and check it out. Care is required though as there’s a 50 metre drop from the edge of the rocks, and falling down there would really spoil your day. The GPS, and a look at the view from the top, confirmed that Conic Rocks (36.116013S 147.423661E, 964m) is in fact the Summit, and so the location shown in the ARM is incorrect. The walking trail ends at Conic Rocks and proceeding further requires a bit of bush-bashing, which is not too difficult but is tiring and time consuming. There are plenty of handy trees on the Summit to provide a support for the antenna, and we soon had the station up and running. I started on 7MHz SSB as usual, and in about 30 minutes operating I made contacts with VK1NAM/2 (S2S), VK4WIL, VK3ARR, VK5BJE, VK2IO, VK3BHR, VK3OHM, VK2BJP/3, VK3PF, VK1MA, VK3AMB, VK3FQSO, VK3WE, VK2YW/M, VK2LEE, VK3FMSC, VK3EK/P (S2S), VK2QW, VK1EM, VK3HRA/P (S2S), VK2MT/P, VK3MCD and VK3AFW. The Shires Contest was in full swing and several of these contacts were with contest stations. When it all went quiet on 7MHz I stopped for lunch, and noted a spot from VK6 saying that they couldn’t hear me over there. Aha, I thought, if the VK6s are about I’ll pop up to 14MHz and see if we can make contact up there. I did that, posted a spot via SOTA Goat, and called CQ for a few minutes on SSB. Eventually I managed a difficult contact with VK6MB, who was clearly having trouble hearing me. There were no more takers on 14MHz so I made a quick foray onto 10MHz CW, where I made one contact with Gerard VK2IO. When there were no more calls on there I was considering packing up, but noticed a spot from VK3MRG/P so I quickly went back to 7MHz and for the fourth S2S of the day. After a quick cup of tea, a last scan around the band produced VK2BBQ/P for the last contact of the day. Never pass up an opportunity to combine bush walking with radio operating! Take care when walking in country like this. There are plenty of places where a fall could do you serious damage. A beautiful, sunny June day can still turn nasty, so don’t forget to take the right clothing and gear.